This is nothing like that. There are only two passages so you might as well read them both. Steven, the morning’s race leader, crashed badly. He was with Vincenzo Nibali and Esteban Chaves on the descent before the final climb when he misjudged a corner, hit a bank of snow and somersaulted off. He stopped twice more on that descent – once to get a new bike – and by the finish, he was almost five minutes down on Nibali. A couple of days ago, they were supposedly doing tests on little Vincenzo in a bid to try and work out what was wrong with him. Whatever it was, nothing’s ailing him any more. 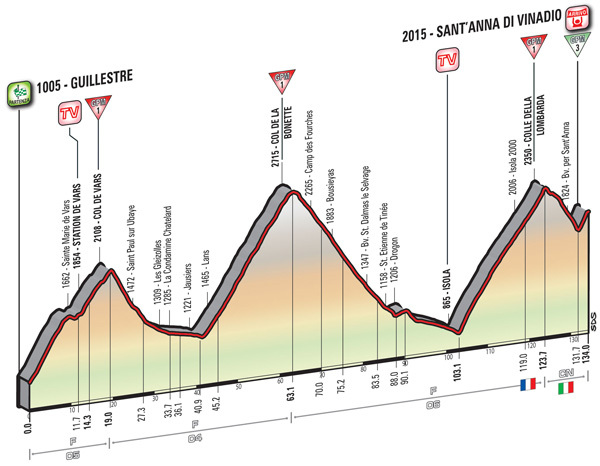 The press have been on Nibali’s back for not winning this Giro, but now it looks reasonably likely that he might. If he dislodged Kruijswijk inadvertently, it was his legs, heart and lungs that did for Chaves as he dropped him on the final climb to claim the stage win. The dust’s still settling at the time of writing, but Ilnur Zakarin’s abandoned after a separate crash. His team say he flew 20 or 30 metres and he’s almost certainly broken his collarbone. Esteban Chaves meanwhile, moves into the race lead. That’s quite signficant, I suppose. (Perhaps there were three passages today.) The Colombian finished third, 53 seconds behind Nibali and two seconds behind Mikel Nieve. This leaves him with a 40 second lead over Nibbles who’s now moved into second place. With another fiendish day tomorrow (Saturday), that lead is precarious. Last of the mountains, but boy what mountains. These mountains are tough enough to make a middle-aged man use an exclamation like ‘boy’. 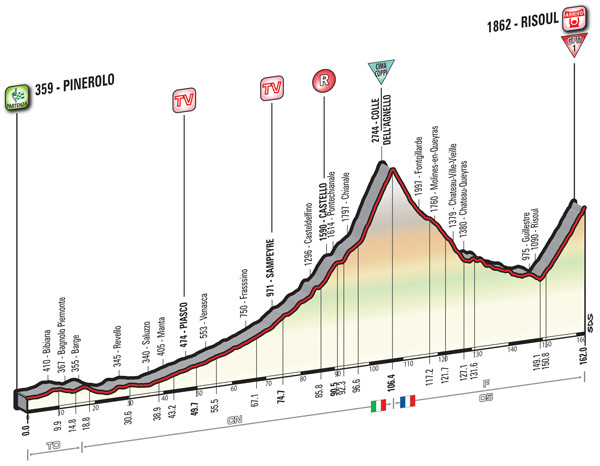 The first climb’s moderate, but still 18km long. The second’s tougher and 22km long. The third’s tougher still and 20km long. All three take the riders above 2,000m.